You don’t need a Gymboree coupon code for fantastic deals with one of the best known and well-liked children’s clothing shops! Gymboree creates quality kids’ clothing and accessories and inspires moms with adorable, color-coordinated collections. They sell clothing suitable for playtime, school days, special occasions and everything in between. If your kids could still use a few pieces to complete their back to school wardrobes, now’s the time to grab some great deals and snag an assortment of beautiful T-shirts, polos (as low as $4.99 each), pants, jackets, sweaters, leggings (starting at $2.99), jeans (as low as $5.99) and more from Gymboree.com. 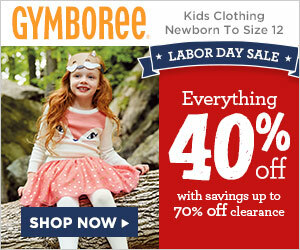 Through Monday, September 7, 2015, save 40% off everything at Gymboree.com plus up to 70% off when you shop their clearance items! You’ll want to act now before your child’s size or favorite color sells out in the most popular items. Here are a few cute clothing items I found on Gymboree.com, but there are plenty more where these came from. Gymboree.com offers newborn through kids’ size 12 for girls and boys.